There are 12 public universities that comprise the State University System of Florida. In addition the Florida College System comprises 28 public community colleges and state colleges. In 2008 the State University System had 302,513 students. Florida also has private universities, some of which comprise the Independent Colleges and Universities of Florida. In 2010, nineteen of Florida's 28 community colleges were offering four year degree programs. In the state of Florida, public primary and secondary schools are administered by the Florida Department of Education. School districts are organized within county boundaries. Each school district has an elected Board of education which sets policy, budget, goals and approves expenditures. Management is the responsibility of a Superintendent of schools. The Florida Constitution allows districts to either elect the superintendent in a popular election (the default provision) or choose (via popular election) to allow the school board to appoint the superintendent. As of 2010[update], school boards in 25 districts (Alachua, Brevard, Broward, Charlotte, Collier, Duval, Flagler, Hernando, Hillsborough, Indian River, Lake, Lee, Manatee, Miami-Dade, Okeechobee, Orange, Osceola, Palm Beach, Pinellas, Polk, Saint Johns, Saint Lucie, Sarasota, Seminole, and Volusia) appointed the superintendent; the remaining districts elect their superintendent. In 2008, there were 619 secondary schools in the state. Education Week evaluated Florida's schools for 2010, fifth in the nation overall, with As for student testing, teacher accountability and progress on closing the achievement gap. It gave the state an F for per-pupil spending. In 2011, the liberal Center for American Progress stated that for half the states it studied, it found no correlation between spending and achievement after allowing for cost of living, and students living in poverty. The Center commended Florida as one of two states that provides annual school-level productivity evaluations which report to the public how well school funds are being spent at the local level. Florida's public-school revenue per student and spending per $1000 of personal income usually rank in the bottom 25 percent of U.S. states. Average teacher salaries rank near the middle of U.S. states. Florida public schools have consistently ranked in the bottom 25 percent of many national surveys and average test-score rankings before allowances for race are made. When allowance for race is considered, a 2007 US Government list of test scores shows Florida white fourth graders performed 13th in the nation for reading (232), 12th for math (250); while black fourth graders were 11th for math (225), 12th for reading (208). White eighth graders scored 30th for math (289) and 36th for reading (268). Neither score was considered statistically significant from average. Black eighth graders ranked 19th on math (259), 25th on reading (244). In 2002, voters approved a constitutional amendment to limit class size in public schools starting in the 2010-11 school year from 18 in lower grades to 23 in high school. This was phased in by the legislature from 2003 to 2009, to promote compliance when the amendment took effect. As of March 2011, 28 school districts had failed to comply and owed fines, which were to be redistributed to districts that were in compliance. Florida, like other states, appears to substantially undercount dropouts in reporting. In 2007, the state's school population grew by 477 students to 2,641,598, which was far below the projected 48,376 increase. School boards blamed rising insurance and property tax costs and the major 2004 and 2005 hurricane season, which have discouraged migration into Florida. Growth in counties such as Miami-Dade, Broward, Palm Beach, Hillsborough, Orange, Pinellas, and Duval counties was under state projections. Hillsborough County was the only one of these to have grown; growth in the county was projected to be 4,537, but the actual increase was only 536 students. Some school districts had backed up the start of the academic year well into August in order to complete the semester and exams before the December holiday break. In 2006, the legislature required districts to start no earlier than two weeks before the end of August, but that was changed in 2015 to no earlier than August 10. The state requires that each school teach for 180 days. Private schools may be open for more than 170 days. Florida does not handpick the best students to take the Advanced Placement exams. In 2010, there were about 60,750 foreign-born children of illegal immigrants attending public schools. The cost per year averaged $9,035 annually. The total cost of educating these children is over $548 million. Paddling students for discipline is legal in Florida. Florida had a voucher system for low-income families from failing school districts from 1999 until 2006. In the final year, 750 students out of 190,000 eligible made this choice. The state paid an average of $4,000 per student as opposed to the $7,206 per student attending public schools. The system was overturned by the Florida Supreme Court for violating separation of church and state, since some students used these for church schools. Between 2000 and 2008, school enrollment increased 6%, the number of teachers 20%. For 2012, StudentsFirst, a political lobbying organization, ranked Florida second among the fifty states, for policy related to education reform. As in most areas, high schools compete in sports in two types of division. One, because of logistical and geographical constraints, is necessarily local. That is, large schools play small ones in the same area. A second division is based on school population and is statewide. Eventually, schools with the best records in this type of division will meet each other for seasonal playoffs to determine the state champion. Competition is under the auspices of the Florida High School Athletic Association. In 2010, the annual tuition. alone, at Florida's 11 public universities was $4,886, third lowest in the country. The average cost total for books, tuition, fees, and living expenses, is $15,500 compared to $16,140 average for the country. In an attempt to save money, entering students may take nationally standardized Advanced Placement exams. In 2010, 67, 741 Florida seniors took the exam. 33,712 scored 3 or more, sufficient for advanced placement. A total of 307,000 Florida students took AP exams in 2010. 64,000 scored a minimum of three or more; 43,000 scoring a four or higher. In 2009, the system employed 45,000 people statewide. The budget was $4.1 billion for community colleges and universities. In 2000, the governor and the state legislature abolished the Florida Board of Regents, which long had governed the State University System of Florida, and created boards of trustees to govern each university. As is typical of executive-appointed government boards, the appointees so far have predominantly belonged to the governor's party. This effect has not been without controversy. In 2002, former governor and then-U.S. Senator Bob Graham (Dem.) led a constitutional-amendment ballot referendum designed to restore the board-of-regents system. Voters approved. Therefore, the legislature created the Florida Board of Governors; however, each university still maintains a Board of Trustees which work under the Board of Governors. During Florida's 2007 legislative session, Governor Charlie Crist signed into law SB-1710, which allowed the Board of Governors to allow a tuition differential for the University of Florida, Florida State University, and the University of South Florida. This legislation ultimately created a tier system for higher education in Florida's State University System. 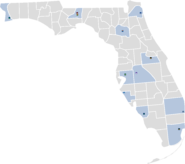 The Florida College System manages and funds Florida's 28 public community colleges and state colleges, with over 100 locations throughout the state of Florida. The Independent Colleges and Universities of Florida is an association of around 30 private, educational institutions in the state of Florida. The association reported that their member institutions enrolled over 121,000 students in the fall of 2006. Additionally, there are many colleges and universities that are not affiliated with the ICUF. ^ "State University System of Florida - Universities". Retrieved 28 June 2018. ^ "Florida Public Universities: List of Public Colleges and Schools". Retrieved 3 April 2018. ^ Spitzer, Michelle (6 February 2011). "BCC ponders 4-year degrees". Florida Today. Melbourne, Florida. pp. 1A. ^ a b "Florida State Constitution, Article IX: Education". Florida Legislature. Retrieved 2009-01-22. ^ "Florida Private Schools". Private School Review. Retrieved 3 April 2018. ^ "Choosing a Private School". Florida Department of Education. Retrieved 3 April 2018. ^ "Home Education". Florida Department of Education. Retrieved 3 April 2018. ^ "Digest of Education Statistics" (PDF). National Center for Education Statistics. 2008. p. 160. Retrieved 3 April 2018. ^ a b Reed, Matt (1 February 2011). "Brevard cannot count on charters". Florida Today. Melbourne, Florida. pp. 1B. Eilperin, Juliet (February 24, 2010). "Former White House adviser Van Jones lands new D.C. gig at liberal think tank". The Washington Post. Retrieved 2012-11-13. Jones, who has been consulting for companies and nonprofits on environmental issues, will start teaching at Princeton University in June and is rejoining the Center for American Progress, a liberal think tank, next month. McManus, Doyle (December 9, 2010). "Obama gets tough – with liberals". Los Angeles Times. Retrieved 2012-11-13. 'The liberal Center for American Progress estimates (optimistically) that the effect of the entire package could be to save or create 2.2 million jobs. Madhani, Aamer (September 12, 2012). "Obama: Romney's Medicare plan to cost seniors thousands". USA Today. Retrieved 2012-11-13. Obama made the charge after his campaign cited a new study to reporters by the liberal group Center for American Progress Action Fund, an organization with close ties to his campaign. Sullivan, Andy (November 5, 2012). "Sandy's winds of uncertainty blow through presidential race". Reuters. Retrieved 2012-11-13. If Obama carries the popular vote by a narrow margin, it could have implications on his ability to govern effectively, according to Ruy Teixeira, a senior fellow at the liberal Center for American Progress. ^ "Return on Educational Investment" (PDF). Archived from the original (PDF) on 2012-06-25. Retrieved 2014-01-16. ^ "Elementary-Secondary Per Pupil Expenditure Amounts by State:2004-05". Public Education Finances 2005 (PDF). U.S. Census Bureau. April 2007. p. 8. Archived from the original (PDF) on 2007-07-08. Retrieved 2007-09-13. ^ "Table 12:States Ranked According to Relation of Elementary-Secondary Public School System Finance Amounts to $1,000 Personal Income:2004-2005" (XLS). U.S.Census Bureau. Retrieved 2007-09-13. ^ "Teacher Pay Review" (PDF). Florida Department of Education. May 2006. Retrieved 2007-09-13. ^ Matus, Ron, (6 March 2005). "Schools still rank near the bottom". St. Petersburg Times. Retrieved 2007-09-05. ^ "Class Size Reduction Amendment". Florida Department of Education. 2011-04-02. ^ Ryan, Mackenzie (March 29, 2011). "Schools sacrifice for size". Florida Today. Melbourne, Florida. pp. 1A. ^ Ramirez, Eddy (May 26 – June 2, 2008). Keeping Count of Students Who Drop Out. US News and World Report. ^ "Comparison of 2006-07 third calculation FTE with projected 2006-07 FTE and 2005-06 FTE" (PDF). Florida Department of Education. Retrieved 2007-09-05. ^ Solochek, Jeffrey S. (27 July 2016). "Why Florida schools are starting so early this year". Tampa Bay Times. Retrieved 3 April 2018. ^ Gillum, Jack (February 4, 2010). "Nearly 60% pass test in Brevard". Melbourne, Florida: Florida Today. pp. 3A. ^ Reed, Matt (January 25, 2011). "$700M paid for illegal migrants". Florida Today. Melbourne, Florida. pp. 1B. ^ Bath, Alison (April 23, 2012). "Paddling A divisive form of discipline". Melbourne, Florida: Florida Today. pp. 4A. ^ Bush, Jeb (March 4, 2009). NO:Choice forces educators to improve. The Atlanta Journal-Constitution. ^ Will, George F. (6 June 2010). "Column:the teacher bailout". Washington, DC: Washington Post. pp. A15. ^ Ryan, MacKenzie (January 8, 2013). "News". Florida Today. Melbourne, Florida. pp. 8B. ^ "Florida Lottery Contributions". Florida Lottery. 2009. Retrieved 2009-09-06. ^ "The week that was:Florida tuition 3rd lowest in US". Melbourne, Florida: Florida Today. 31 October 2010. pp. 12B. ^ "Florida's colleges good value, survey says". Melbourne, Florida: Florida Today. 6 January 2010. pp. 6A. ^ "Tallahassee:Number of state students taking AP exams rises". Florida Today. Melbourne, Florida. 10 February 2011. pp. 6B. ^ Rockwell, Lilly (April 8, 2011). "Lawmakers consider tougher AP test scores". Florida Today. Melbourne, Florida. pp. 5B. ^ Associated Press (24 April 2009). "College presidents unite to protest education cuts". Melbourne, Florida: Florida Today. pp. 8B. ^ Klein, Barry (8 May 2001). "Bush's trustees mostly in GOP". St. Petersburg Times. Retrieved 2007-09-05. ^ Zaragosa, Luis; Kennedy, John (28 June 2007). "Tuition will jump at 3 universities". Orlando Sentinel. Retrieved 2007-09-05. ^ "Florida Colleges". Florida Department of Education. Archived from the original on 2009-12-01. Retrieved 2009-12-03. ^ Atherton, Blair (August 2006). "2005-2006 Accountability Report: Quality, Productivity, Diversity, and Access" (PDF). Archived from the original (PDF) on 2007-08-08. Retrieved 2007-09-14. This page was last edited on 28 June 2018, at 11:29 (UTC).